Happy 50th Birthday, To My Sister, Patty! We are supposed to be celebrating another big birthday in our family this year. While I'm sure that Patty is celebrating it in style this year, as she has for the past 6 years...in heaven with Jesus and her family and friends who have also gone ahead of us, (and I'm sure it's an absolutely magnificent party)...but she will be sorely missed here on earth today. Patty passed away on April 27, 2003, after a valiant, 2 year battle against breast cancer. Since I was just a year and a half older than her, she and I were quite close. In fact, I have another sister, Connie, who was born exactly one year and 4 days AFTER Patty was, and the three of us were all very close, and were always referred to as the "three little girls" growing up. 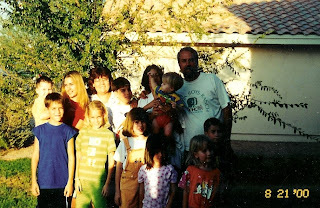 I come from a very large family, having 4 other sisters and 3 brothers as well...and though I dearly love all of my siblings, none were ever as close to me as Patty was. We shared a room for a few years at home...where we told each other our deepest and darkest secrets...and swore we'd never tell a soul. We giggled the nights away, or at least until Mom or Dad yelled up the stairs to be quiet. Once we were over 18, we ended up sharing an apartment along with a friend of ours. During those days, we took care of each other. If we wanted to go out, or needed groceries, and one of us didn't have any money, the other would say, "That's okay, I'll buy." We never, ever kept track of who "owed" whom. We just didn't care. As adults, she taught me a lot about Christianity...even though she was the younger sister. I always knew where to go when I needed advice and an advocate, who would be in my corner, no matter what. Even though in later years, she lived a few thousand miles away from me, she was just a phone call away. Patty was a wonderful sister, daughter, friend, wife and mother to 11 children. Yes, 11 children. I'm praying today for her entire family, for all of her children, for their health and welfare, and that while they remember and celebrate their mother today...that they would also remember the importance of staying together as a family, and lifting up and supporting each other. Happy Heavenly Birthday, Patty! ...and the house was a MESS! Christmastime is definitely my favorite time of the year--at least it should be, if it weren't for the extra work involved. There's so much to do, even before I get around to hauling out the holly, or hauling the artificial Christmas tree up from the basement, as it were. Maybe it would be nice if I just didn't have to do all the regular hum-drum everyday chores, along with all the extra stuff to do this time of year. 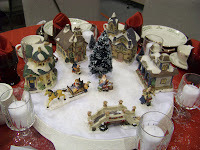 I was thinking it would be wonderful to have one of those commercial janitorial services come in and take care of the stacks of dishes, the mountain of laundry, the dusting, (I could pretend the dust is snow, and set my little Christmas village up in it...), the vacuuming, cleaning the windows etc, etc. Wouldn't it be awesome to have the whole house clean at once, before I even get around to the decorating? Just think, I could leave all this stuff to the professionals and take my daughter and my grandson out shopping. We could make a whole day of it. We could even find one of those ubiquitous "Santa's helpers" in the mall and get Christian's picture taken with him. They could each pick out a gift for the children's gift exchange that our family does each year, and then at least THAT part of the shopping would be done. We could have a nice relaxing day...and then...the best gift of all, would be coming home to a sparkling clean house. Okay...waking up from my long winter's nap now...guess I'd better get busy cleaning! Oh well, it was a nice dream while it lasted. 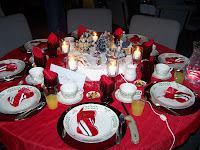 Last Saturday night was our annual "Old Fashioned Christmas, at church. 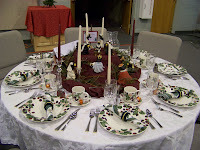 Several couples host tables, decorating them and inviting guests to join them. 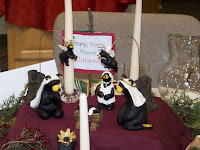 This year, we decided to do a table again, sort of at the last minute, because there were more church members that wanted to attend, then there was room at the tables for. I'm glad we did. It was a very nice evening. This was our table. 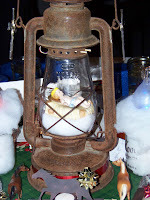 I used the lighted village I got from Molly and Christian last year, for Christmas. We had to set up near an outlet, so we could plug in, of course, but it worked out quite well. This is our table lit up with candles. I found the cute little stockings the night before, for just 50 cents apiece and took them home and wrote names on them, and then filled them with candy. At that point, we only had 5 guests coming, so with the two of us, there were seven...but it was a good thing that I'd set the table for 8, (just in case) and bought an extra stocking. While I was doing them, we got a call from the coordinators, saying that one of the couples at our table was bringing the foreign exchange student that was staying at their house. Cool! Our table would be filled...and it was very nice to meet this young woman from Brazil, and she seemed thrilled to have a stocking with her own name on it. Try writing "Carolina" with glitter glue on a miniature stocking sometime! It's a good thing I have lots of practice writing with icing...it's kinda the same. 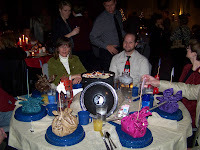 Before we had planned on doing our own table, we'd been invited to join some friends at their two tables. 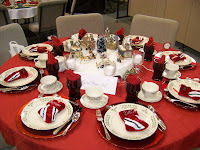 I think this is the third year that my friends, Jody and Lisa have gotten together with their husbands to do two tables...one for the girls, and one for the guys. I hated backing out on them at the last minute, but I figured if there were that many people that needed a place to sit, they could easily replace us. Well, it wasn't as easy as I hoped, but in the end...they filled out their tables too. Unfortunately, AGAIN this year, Jody's husband Dan was called out of town on business and wasn't able to attend. Here's the ladies table. 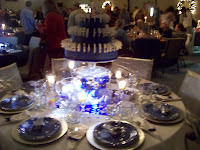 Lisa used her expert cake decorating abilities to make this gorgeous cake for her centerpiece. She's got a lot more patience than I do. 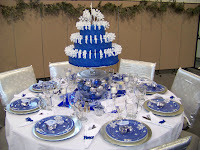 She ended up making hundreds of snowflakes out of royal icing, to get enough unbroken ones to put on her cake. The cake itself was made of styrofoam, but the icing was real. The table turned out to be very beautiful and elegant. Meanwhile, their "better" halves were busy working on an interesting table of their own. 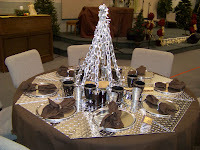 Donnie and Dan had cut pieces of metal plating to serve as a table cloth, and fashioned a Christmas tree out of welded chains for their centerpiece. There were nuts and bolts all over the place, as well as tools and work gloves, all to give it that masculine feel. This table got a LOT of attention! Good job guys! Hopefully, next year Dan will be able to actually attend the event and sit at the table he is hosting! Below, is a picture of the table lit up...and I do mean LIT UP! 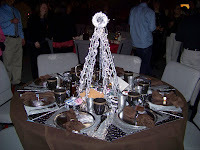 There table was right in our line of sight to the stage...and thankfully, Lisa saw to it that the tree lights were turned off, so as not to blind us! Thanks, Lisa! The sign says "Have a Beary, Berry Merry Christmas!" Clever! 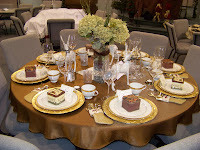 This gold table, was decorated by the coordinators of the whole event. I love how it turned out! 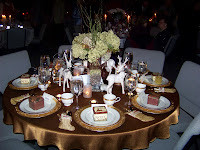 Their table was very rich and elegant looking. Above it is pictured with the room lights on, and it was very pretty, but below, it was even prettier by candle light. 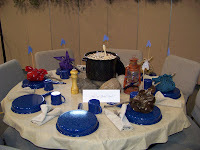 The table below, was decorated by our friends, John and Julie F. with a kind of a horse theme. Julie loves horses and has one of her own. 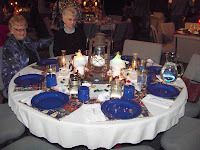 There is an old fashioned lantern in the center of the table..
Jesus IS the LIGHT! Duh. This is the Hobo table. We were thinking they should have started those beans a few hours earlier though...it's a good thing we had chicken, potatoes, salad and dessert served to us, those beans were taking forever! Here are the head hobos themselves, John and Jackie B. 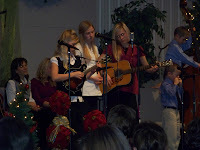 For entertainment this year, The Kingery Family performed. 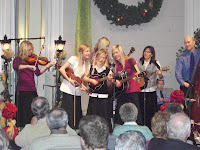 They are a local group from Minnesota, who play and sing bluegrass music. I've never seen so much talent in one family in my entire life! I was very impressed with their musical abilities and their awesome voices! They have six daughters, and two little sons...and they are all very, very gifted musicians! The Girls' harmonizing was amazing! And then the little boys got into the act. 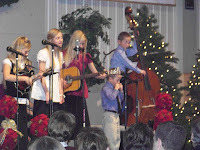 The older of the two actually had to climb up on a chair to play his dad's bass! The little one played the harmonica. The family had recently been featured on Jason Davis's "On the Road" program, and the dad said that Jason Davis kept calling it a "harmonicker." I'll have to watch for that episode to be on again. Does God speak to you? I sincerely believe that He does speak to everyone...we just need to learn how to listen better. Or maybe it's like Horton says in "Horton Hears A Who," perhaps it's because our ears are too small. Anyway, a few weeks ago, I started a bible study at church, that's called, Discerning the Voice of God. "Coincidentally," I was reading this book, "Treasured" during the first few weeks of the study. Instead of reading it cover to cover, I decided to just read one short chapter per day or so. Kind of like a devotional. Well...there is a chapter in this book called, "Balam's Riding Crop, The God Who Speaks." In that chapter, Ms. McLeroy points out that God, the eternal Creator of our universe, sometimes uses extraordinary things, (like Balam's donkey), but more often, He uses plain old every day things like a song on the radio or the book you happen to be reading. While I was reading that, I had to chuckle to myself, because God WAS speaking to me through this very book. You see, I'm a bit ADD and usually need to hear or read something numerous times to get it to stick in my brain. The funny thing was, I would go and listen to the video at bible study, hear something and then read the same thing that very night! We need to learn to listen better to the "Still Small Voice" of the Holy Spirit. I really enjoyed this book, because like I said, it is set up so you can take your time with it, and read one short chapter at a time. Each chapter is about one certain thing that God tells us about in the bible, in order to know HIM better. For example, A Fig Leaf (Adam and Eve), A Fresh Olive Branch (Noah's Ark) or A Shepherds Harp String (David). The author talks about how we all save souvenirs in our cigar boxes, etc. to remind us of important milestones in our lives. She says God kept these keepsakes, tucked deep in the pages of His Word to tell His story and to help us understand our own. I would definitely recommend this delightful little book, perhaps as a stocking stuffer, for a loved one that you would like to make feel "Treasured" by you! You can find more information about "Treasured" or purchase it at RandomHouse.com for $14.99. In Treasured, Leigh McLeroy considers tangible reminders of God’s active presence and guides readers in discovering evidence in their own lives of his attentive love. “The idea for the book came from a cigar box filled with odds and ends of my grandfather’s life that arrived a few months after his death. Sifting through the objects in the box, I experienced him in a fresh new way. This made me wonder what treasures might be tucked away in Scripture that could frame God for me in an equally intimate, tangible way. This process also helped me uncover my own “treasures” of my walk with the Lord: objects that remind me of my history with him and his faithfulness to me,” says McLeroy. Drawn from the pages of Scripture, the author considers twelve such treasures and personalizes their meaning for readers, such as a green olive branch that offers proof of God’s “new every morning” mercy and a scarlet cord that demonstrates his willingness to adopt “strays” of every sort. Weaving these treasures together with scenes from her personal history, Leigh McLeroy invites readers to discover God’s heart for them and embrace their unique role in his redemptive story. Treasured offers readers a guided experience of God’s love and character and invites them to consider their own treasures that point to their part in God’s ongoing story. Leigh McLeroy is the author of The Beautiful Ache and The Sacred Ordinary. An avid collector and recorder of everyday moments, words, and wonders, Leigh’s keen eye for God’s presence in ordinary life infuses her writing and living with a deep, insistent joy. 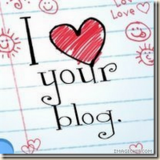 A frequent conference and event speaker, the author makes her home in Houston, Texas, and posts often on www.leighmcleroy.com and www.wednesdaywords.com.